My goal isn’t to satisfy customers; I want to thrill them. A great way to measure how you’re doing is through Net Promoter. 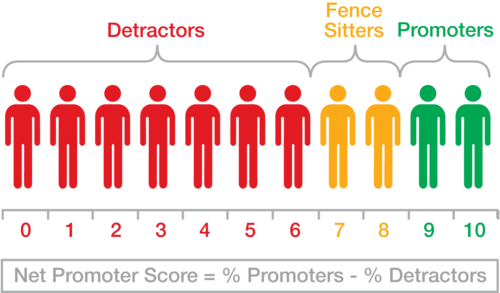 Net Promoter is a way to measure customer engagement and loyalty. It is a score that is the result of asking one question to your customers and prospective customers: On a scale of 0 to 10, how likely are you to recommend Berlin Packaging (or any other company) to a friend or colleague? Essentially, after Promoters cancel out any Detractors, how many Promoters are left over to evangelize about your company? Net Promoter is a powerful concept. Research has showed there is a direct correlation, across industries, between companies with a higher Net Promoter and companies that are more successful financially. Their revenue grows faster, for example. It’s very easy and simple to execute in the marketplace. Berlin manages it internally and the cost is zero. It’s a very short survey to complete, which increases response rates. It is quantitative and can be baked into management systems. We’ve taken these ideas and embraced them at Berlin Packaging. I think we are unique in the packaging space in our focus on customer thrill. I see our approach to the customer experience as a true competitive advantage. We spend more time thinking about, improving, and delivering against the customer experience than any other company in our sector. And we have great results. An independent study done last year showed that we led the packaging industry in customer thrill. Our Net Promoter is way up from 2010, the first year we measured it. Our Net Promoter is approaching the levels we see at JetBlue or American Express… companies that are known for their great service. I’ve applied Net Promoter also to the South Bend Cubs. We looked at every touchpoint a visitor to the ballpark has – from driving to the field and parking to listening to the music and eating our food. We try to inject thrill into every part of a visit to a game. We’re doing all this because it’s good for business. We know that thrilled customers are going to give us more of their wallet, stay with us longer, and promote us to prospects and, thus, making our acquisition efforts easier.